fabric donation from Judy M.
Judy M. from Lynchburg, VA asked if she could send some fabrics to make Quilts of Valor, and the bulging box arrived last week. I was gobsmacked by the contents: a stack of fat quarters, three layer cakes, multiple yards of fabric, and some scraps. Judy's generosity is greatly appreciated and will make several QOV possible. Very nice and very pretty. Enjoy the enhanced fabric stash! Wow! Such a generous gift, plus she probably finds big comfort in knowing it will be used for QOV. Awww, Fun mail for you.. QOV is such a great cause. No wonder you devote so much of your energy and love to those quilts. That was such a generous and beautiful donation from Judy. My thanks to her and to you for making the quilts. As someone who is married to a Veteran, seeing people with generous hearts like you and Judy are such a blessing to me. What a gold mine! I'm sure we'll be seeing a lot of interesting quilts coming through your house. Special thanks goes to Judy! That is so lovely of Judy, and those fabric patterns are beautiful! It's going to be so much fun assembling with them. wowser! Judy is a very generous lady. I can see you have great fun with that fabric. What a lovely surprise and very thoughtful as she knows your dedication to Quilts of Valour. 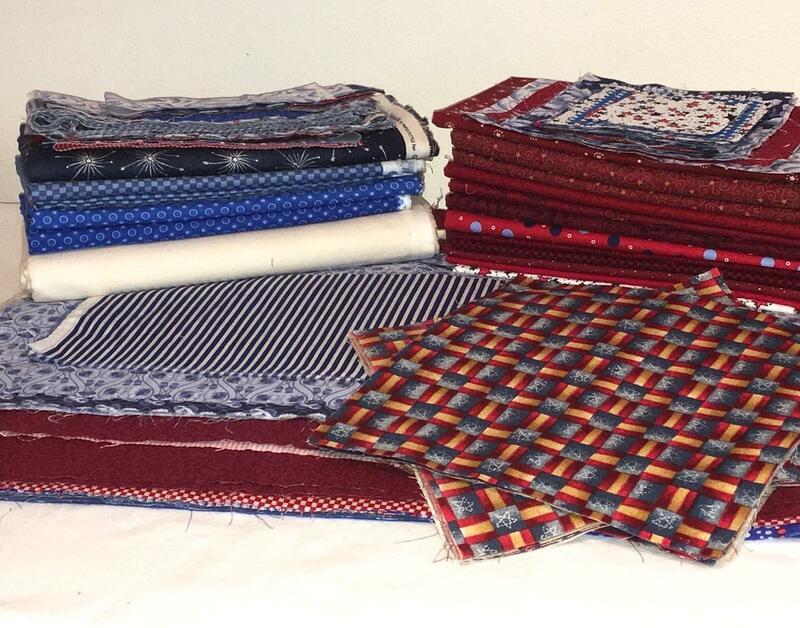 A friend of ours recently asked if we would like a bag or two of quilting scraps that were going to be trashed. Would we what! We had a wonderful time sorting through them all and have now got quite a stash of harvesting to do on the smaller pieces. She sent them to the right home-they will be QOV in no time!